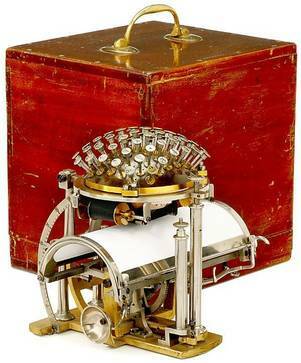 The Malling-Hansen writing ball was the world's first commercially produced typewriter, and it was sold world wide. For his invention, Malling-Hansen received the First Price medals at the Scandinavian Art, Agricultural and Industrial Exhibitions in Copenhagen in 1872 and 1888, at the World Exhibitions in Vienna in 1873 and Paris in 1878 and at the Philadelpia Centennial in 1876. It was also exhibited on the first annual Kensington Exhibition in London in 1871. The first model was patented in 1870, but soon went through a lot of improvements, even though the "ball" itself remained the same. On the picture to the right, the writing ball has gained it's well known shape in 1878. 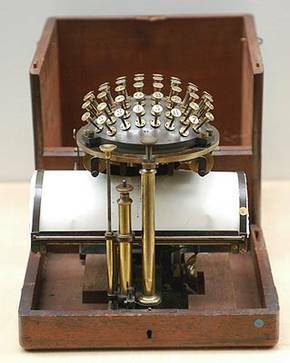 The writing ball was not only the first typewriter to be produced and sold in a relatively large quantity, it is also the fastest typewriter ever made, because of the unique construction of the "ball". Malling-Hansen was experimenting with the placement of the letters already in 1865 - and he succeeded in finding a placement of the letters that made the writing speed extremely fast. Not many people know that the traditional qwerty-keyboard was designed with the goal of preventing the arms from "hanging up" in each other, and in no way was designed to get the fastest writing speed - on the contrary! The writing ball consists of a semi-sphere with radial pistons, which can be severally pushed down to the center of the sphere, where the type is printed on a paper surface (by means of carbonized paper or a ribbon). The whole apparatus (the writing ball included) is mounted on a stationary foundation plate in such a way that it can be moved down against a spring, when the writing ball or one of its pistons are forced down by the finger. The foundation plate has an upright anvil under the centre of the ball and directly under the paper frame. When a knob of a type piston is depressed, the paper resting on the anvil, below the same receives an impression. When the finger pressure on the type piston knob is removed, the instrument swings into its normal position. The escapement mechanism moved the paper frame that held the paper on space until the end of the line was reached. By pushing the button on the left in front of the ball all the way down, the carriage was turned concentrically back to the beginning of the line and moved one line to the left. But, unfortunately Malling-Hansen's writing ball lost the commercial competition, even though it was clearly a better typewriter, and when Malling-Hansen died in 1890, at the age of only 55, the order he had placed for the production of 100 writing balls at the mechanic Lyngbye in Copenhagen, was cancelled, and the writing ball was never made again later. Member of the Malling-Hansen Society, Uwe Breker of the Auction Team Köln has written this very accurate description of the writing ball. I think his words show very clearly Mr Breker's great admiration and fascination of Rasmus Malling-Hansen's brilliant invention! His description was written in connection with the sale of an extremely well kept writing ball, in the summer of 2007. My information tells that the writing ball was sold for 80.000,- EURO. Note that Uwe Breker refers to the year 1867 in connection with the writing ball. 1867 is an estimation of when the first specimen was finished - but we don't know this with 100 % certainty. What we know is that Malling-Hansen worked on his invention in 1865, and that the actual ball with the keys was worked out at this point. Malling-Hansen got his first patent in Denmark in 1870. During the 1870's and -80's some hundred writing balls were sold, and each specimen was made by hand, by highly skilled mechanics. The writing ball sold by Uwe Breker is a model from 1878, with a colour ribbon. 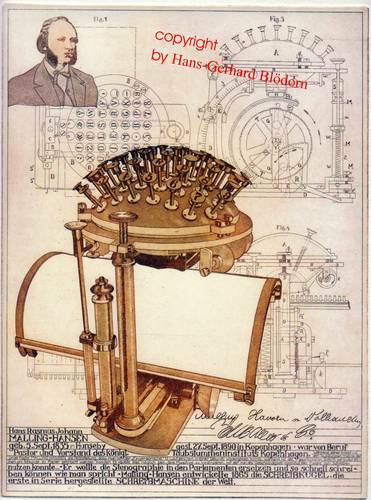 This fascinating machine, the 1st typewriter in the world produced in series, is historical. Pastor Hans Rasmus Malling Johan Hansen - director of Denmark's deaf-and-dumb institute in Copenhagen - invented this wonderful precision machine: Each of the 54 spring-driven hemispherical typebars slides in a different angle to a tiny central printing pole, which means that every single letter has to be distorted differently. All these letters had to be engraved onto the end of the little typebars which was done at Malling-Hansen's time only by professional copperplate engravers of type foundries for the printing process. These artists are no longer available, as (decades ago) all the world's type foundring companies went out of business when typesetting switched from hot to cold composing (electronics).Technically this 1st typewriter in the world from 1867 already showed all significant refinements of typewriters that were introduced 40-50 years later: space bar, automatic carriage return and line spacing, index for paragraphs or indented lines, bell to signal the end of the line, typing copies by carbon paper, ribbon reverse and - last but not least - visible writing by raising the typing mechanism. - These were and still are sensational technical refinements which were unbeaten for the almost 50 following years. - Not only does the high technical precision work of this Malling-Hansen writing ball fascinate us, its fascinating brass design is also captivating. - From a total of (presumably) 180 machines ever made there are only 4 models left today in private hands (and 2 of them with Moon's blinds' alphabet on the keytops and not useable for ordinary characters' writing). All the others (about 30) are already included in museum collections worldwide, and therefore "lost" for the market and for any private collector. - This model here is in the best condition we've ever seen (!) and absolutely original in all parts and details! The serial number is 97! 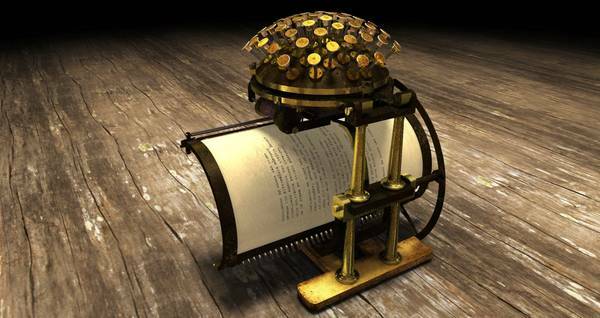 - The writing ball by Pastor Malling-Hansen has for many years been the world's most expensive historical typewriter with up to euro; 131.00,- (US$ 123,000)! 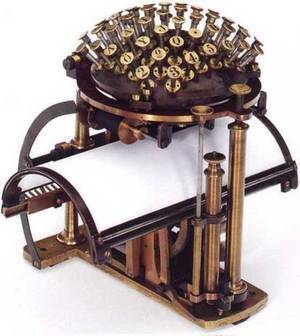 - No doubt that this very 1st typewriter in the world is technically as well as optically the giant showpiece of any advanced collection and exhibition worldwide! 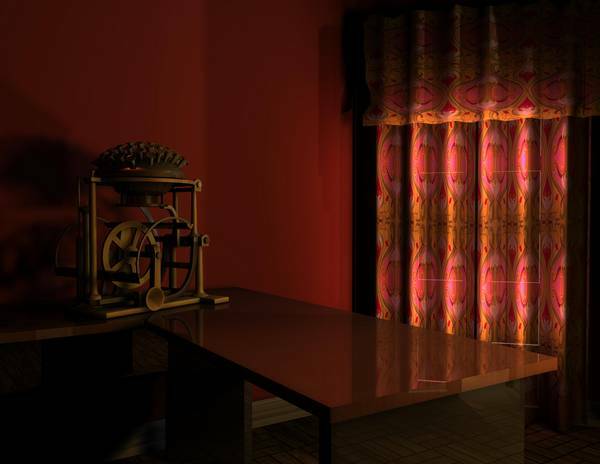 Computer image from an interactive visualization made by German student, Felix Herbst! 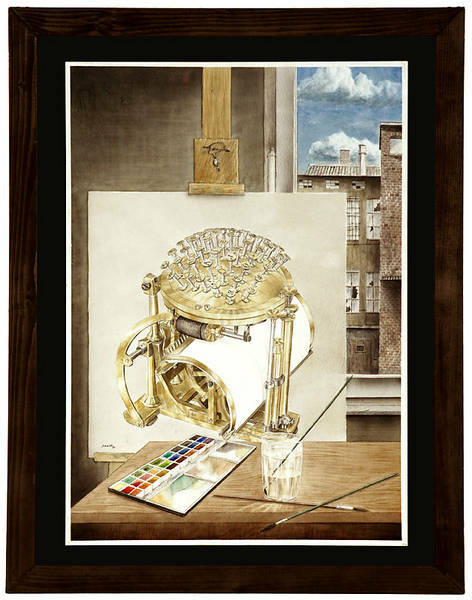 A brilliant piece of work, based on patent drawings and pictures of Friedrich Nietzsche's Writing Ball, a 1878 model with colour ribbon. Copyright: Felix Herbst.